We’d love your help. Let us know what’s wrong with this preview of All the Mathematics You Missed by Thomas A. Garrity. To ask other readers questions about All the Mathematics You Missed, please sign up. 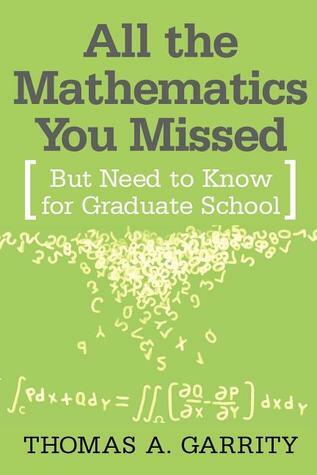 Overview of mathematics that one should have been exposed to upon reaching Graduate School. Very wide breadth, but little depth to each subject covered. However, Garrity does have a bibliography for further study and reference. It has problems in it, but to be honest, I never passed Calc II, so it was a bit beyond what I could do, but it did have the proofs of a number of things and it showed Stokes' Equations and other things that you would encounter. Very fascinating, and the bibliography gives Overview of mathematics that one should have been exposed to upon reaching Graduate School. Very wide breadth, but little depth to each subject covered. However, Garrity does have a bibliography for further study and reference. It has problems in it, but to be honest, I never passed Calc II, so it was a bit beyond what I could do, but it did have the proofs of a number of things and it showed Stokes' Equations and other things that you would encounter. Very fascinating, and the bibliography gives me a bit of new reading material. Also, one of the few books that tried to explain Set Theory notation at least a little, so it gains something for that. If I would sit down with the book and try the problems and focus, I could probably succeed at doing some of them, but I didn't really feel like spending the time trying to solve any of the problems. I really didn't have any issue with the depth of coverage either, since he mentions in the book that you should have been exposed to this stuff already, so it's more of a reminder or primer than an in-depth coverage. Too light on the abstract algebra and a bit wrongheaded on occasion with some of the general commentary (no, the prevailing belief is not that P=NP is a statement independent of other axioms- see for example Aaronson's paper on the subject), but very useful nevertheless. This is a well-written, Cliffs Notes summary approach to university level mathematics. The definitions are clearly stated where you may have found that...say an abstract algebra text is written in a different language that only closely resembles English. I'm using it as a research aid for a paper and presentation on the solubility of the quadratic, cubic, and quartic equation but the insolubility of polynomial equations of degree 5 or higher. In addition to the summaries provided, there are recom This is a well-written, Cliffs Notes summary approach to university level mathematics. The definitions are clearly stated where you may have found that...say an abstract algebra text is written in a different language that only closely resembles English. Not a textbook. Useful for structuring a reading list on the various topics. My background varies, generally good on the more abstract conceptual stuff (I know way more about logic and foundations coming out of philosophy than could ever be useful) to very ignorant on actual techniques of integration and problem solving, which I am seeking to fix. 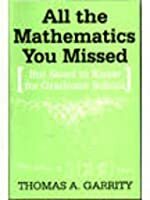 I'm not sure how much math can be learned from a book that covers this many mathematical topics in 300+ pages, but this book does provide a good refresher for those who have studied these subjects in the past. Each section includes a brief discussion of recommended books for further reading if interested. A book teaching you math assuming you already know math well. Sweet sweet Irony. Good if used as reference rather than to learn a missed topic.